Designed for a lightweight "micro" or "travel" type 3-wheel scooter, is compact in size. Light weight at a mere 70 lbs. 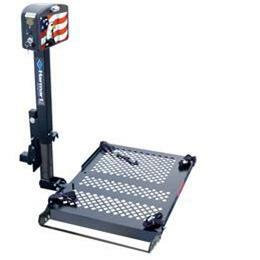 - the can be mounted on a Class 1 or larger trailer hitch. The unique "hold down foot" feature outpaces the competition by providing a safe, fast and easily applied method of firmly securing the scooter to the lift. Combined with the Swing Away Option, the retains easy access to the trunk or lift gate of the vehicle.